INFORMATION FROM Lion TV; creators of popular shows like Horrible Histories and House Swap. 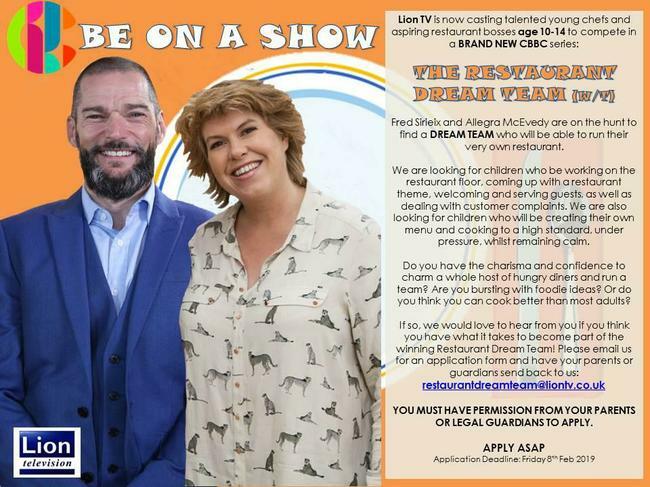 We’re currently making an exciting, new kids TV show for CBBC called RESTAURANT DREAM TEAM – a cooking competition where children will compete to see who will be able to run their very own restaurant. They’ll be working closely with celebrity foodies, Allegra McEvedy and Fred Sirieux who will judge them on their front of house skills as well as their cooking.